The Velenje Coal Mine (Premogovnik Velenje d.d) operates the largest Slovenian coal deposits and one of the thickest known coal seams in the world. 165 metres thick, its lignite layers have enabled the production of over 220 million tonnes of lignite so far. Piled on wagons, it would make up a train that could encircle the Earth twice. First mention of the coal deposits goes back to the 18th century, first drilling to 1875, and the first mines to 1887. Daniel pl. Lapp was the first to succeed in producing relevant amounts of lignite after the main lignite layer had been discovered in 1875, the year regarded as the “birth” of the Velenje coal mine. After the first shaft had been opened, miners managed to continually increase production despite exclusively manual work. One of the contributing factors was a new railway line, which enabled sales to distant consumers. The first thermal power plant, lignite-based, was built near the coal mine back in 1905. Coal mining in the Šaleška valley experienced its biggest boom after World War II, when the demand for coal skyrocketed. Coal production continued to increase until the 1980s when the Velenje Coal Mine accounted for as much as three quarters of all Slovenian coal. 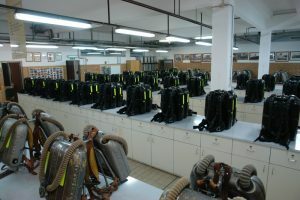 Modern equipment and the company’s own coal mining method could barely cover the demand for coal in 1980’s. It was the country’s former appetite for energy that made the Velenje Coal Mine reach its peak annual coal production, 5 million tonnes of coal, in mid 1980’s. Nowadays, Premogovnik Velenje is a technologically advanced company with lignite mining as its primary activity. The lignite produced in Velenje is used to power the Šoštanj Thermal Power Plant, which uses the annual coal output to generate one third of all electric power consumed in Slovenia. In the Velenje Mining Method, the coal face is divided in the footline section and the hanging wall section. The footline section is 4 to 5m high and secured by the hydraulic support system which allows mechanised exploitation by using excavation machines – shearer loaders and the conveyance of coal by using efficient chain conveyers. The hanging wall section, measuring 5 to 17m in height, is exposed to dynamic stress conditions which cause the crumbling of the coal layer; the crushed coal is then poured onto the conveyor and promptly transported to the surface. With over 140-years tradition in lignite mining, the mine is firmly rooted in the Slovenian energy economy. At today’s mining output, there are enough deposits of the Velenje lignite for another four decades of coal mine operation. 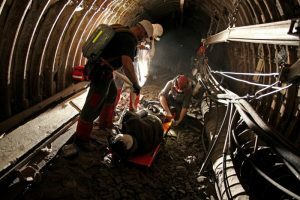 Due to changes in the energy industry and envisaged changes in the operation of the thermal power plant, mining sites will close before the lignite reserves are exhausted. To rationalise the process of coal production, developmental projects are under way in Premogovnik. Included here are projects in clean technologies for coal consumption, electric power, roadways, transport and logistics, optimisation and automation of coal transport, the ecology of work, management of people at work, and occupational health and safety. 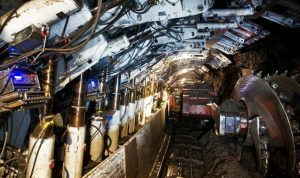 The developmental nature of various projects shows promise that the company’s new activities will turn out to be as important for the life of the Šaleška valley and the wider region as the operation of the coal mine has been for Slovenia as a whole. Premogovnik Velenje, an associated company of Holding Slovenske Elektrarne, excels in its great sense of social responsibility, both in terms of solving environmental issues, securing sustainable development, and preserving jobs for the life of the Šaleška valley and the wider region. As a process of underground coal extraction, coal mining is often regarded as an activity with adverse impacts for the environment. Due economic and social pressures, the environment is sacrificed in many of the areas with reserves of this important energy source. 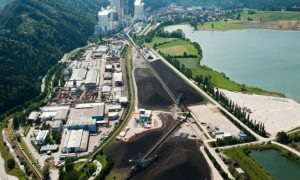 Aiming to bring coal mining in line with the principles of sustainable development, Premogovnik Velenje has reduced its adverse environmental impact substantially. Premogovnik Velenje has dealt with preventing and eliminating negative effects on the environment ever since its beginnings, and has been an active part of a land, air and water protection programme in the Šaleška valley for a number of years. A tourist and sports resort has been developed around the lakes that are a result of coal mining activities. The company also regularly monitors its environmental impact and eliminates its negative effects. Its primary goal is to provide a healthy working and living environment. Thus, Premogovnik Velenje makes and important contribution to preserving life in the Šaleška valley and providing new jobs. You can tour the virtual mine at http://www.rlv.si/si/VRRLV/nacrt.html.